I’ve heard of many candidates who rocketed from less than 5 pullups to a max set of 10-15 using the Armstrong Pullup Program. The improvement came fast and strong at first. Everything was great. 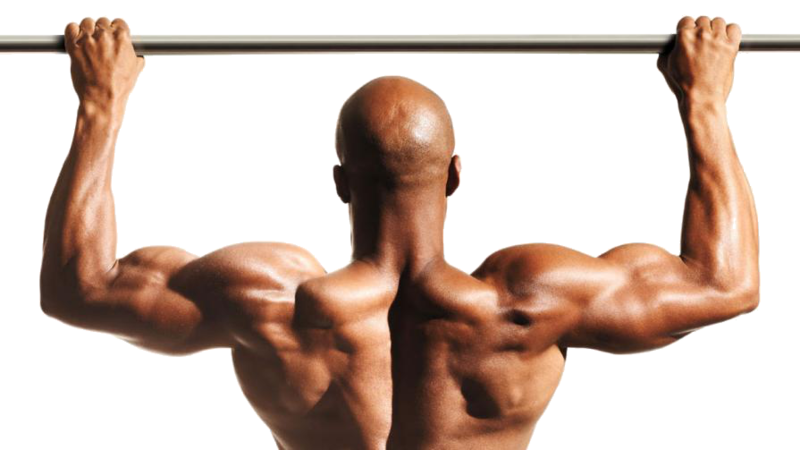 Get a pullup bar and bust that plateau! You gained one, two, three pullups a week. You did it all right. Fifty pullups a week went to over a hundred. Then it stopped. You’re stuck at your current level of pullup fitness. So what’s going on? In many cases, overtraining is holding you back. With only a day or two of rest during the week, the muscles are getting broken down but don’t have the chance to build up and recover. Are you resting a day after each hard workout? Are you eating enough protein and getting enough sleep? On the other hand–is it easy to get a set of more than 10 pullups done? Maybe you need more resistance for each “rep” of the exercise. Have you tried the Armstrong Advanced workout? Also named in honor of Major Charles Lewis Armstrong, it is designed to pick up where the standard five-day-a-week Armstrong Pullup Program left off. Begin the workout without weights to establish your personal number of pullups per working set. Start with a weight of 5 lbs or less. Increase your working set by one repetition when you can complete all five sets. When you can complete 5 sets of 8 pullups, add weight, not reps. The repetitive structure of the Armstrong Pullup Program Advanced makes it easy to standardize your improvement by using the overload principle to steadily increase either reps or weight, as appropriate. You should expect to fall a little short of your working set goal on the fourth or fifth sets of the workout. Don’t have a weight belt? No excuses! Grab an athletic drawstring backpack and drop some 1kg plates in it. Wear cargo shorts and put the plates in your pockets! Who cares how–get it done! Don’t combine the workout with any bicep or lat-intensive activity like rowing, to avoid overtraining or interfering with your results. Get yourself an indoor pullup bar. Grab a weighted dip belt or whatever you have lying around. Got any feedback? Are you one of the candidates who plateaued on the Armstrong Basic workout? Please leave your feedback below. Weighted pull-ups helped me break my plateau. Definitely a great recommendation! Just be careful of going too heavy as you risk picking up a mean case of tendonitis. Great advice! Overtraining is a common problem for knee issues from running, and can definitely hit you with the elbows, for example, from pullups. Just to clarify do 5 sets, say I can do 15 solid unweighted( 18 is the most I ever got) do I shoot for 4 sets of 15 with a 5# weight or do I put enough weight on to bring me down to the 8rep range? You want to be able to do working sets of 8 reps. Eight and no more. So even if your max is 15, use whatever weights it takes to get you down to working sets of 8. The total workout of 8-rep sets should exhaust you, not necessarily each set, especially the first ones. Is that clear? This is great. Armstrong got me from zero pull ups to a steady 15-16 over the last year. I’ve been stuck there for the last few months and hopefully this will help me bust the plateau. Agreed on the tendonitis – constant body weight push/pulls and Armstrong over many months was wearing down my left elbow to the point where it was painful to do anything. (Un)luckily a broken hand has made me take a month off and the elbow seems to have healed as well. Hopefully haven’t lost too much strength in the meantime. Anyway, this website is great. I’ve got it bookmarked on my work computer to keep me motivated – temporary medical DQ expires in November and plan on talking to an OSO the next day. Should the second and third sets be till failure? I did 8 reps with 50lbs, rested a minute and was all the way at 5. Am I doing it wrong? Previous Previous post: New Partner: USNA or Bust! Next Next post: Guest Post: Hey Motivator, Are You Overtraining?